Elfriede Brüning was born in Berlin to working-class parents involved in the German workers' movement. She had to leave school at age 15 to help support the family, and did secretarial work at a Berlin film company, among others. She began to write articles that were accepted for publication in newspapers such as the Berliner Tageblatt, the Berliner Börsen-Courier and the Vossische Zeitung. In 1930, she joined the German Communist Party (KPD) and wrote articles mainly for the Communist press. Her first novel, Handwerk hat goldenen Boden, scheduled for publication in 1933, could not be issued due to the Nazi regime's rise to power. It was finally published in 1970 under the title Kleine Leute. Elfriede did mange to publish Und außerdem ist Sommer in 1934. ]During the early years of the Nazi regime, she took part in the Communist resistance, writing for the German exile newspaper Neue Deutsche Blätter under the pseudonym Elke Klent and making trips to Prague, where it was published, as a courier. In 1935, she was arrested and imprisoned on charges of treason, but released in 1937 for lack of evidence. She was obtained permission to write while in prison, and 1936 she published another novel, Junges Herz muß wandern. In 1937 she married Joachim Barckhausen, also a writer, with whom she had a daughter, Christiane Barckhausen, who also became a writer. During World War II, Elfriede worked as a script reader for a film company and with her husband co-wrote the scenario for the movie Semmelweis – Retter der Mütter (Dr. Semmelweis), which was filmed in 1950. She spent the last years of the war living at her in-laws' estate in Saxony. She returned to Berlin in 1946 and wrote and edited news periodicals in what later became East Germany, later becoming a freelance novelist and writer. She wrote the screenplay for the 1962 TV movie, Rom, Via Margutta. After the reunification of Germany, she continued to write about social injustice, including those of the reunification, and continued to give interviews into her old age. 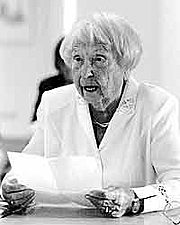 Elfriede Brüning is currently considered a "single author." If one or more works are by a distinct, homonymous authors, go ahead and split the author. Elfriede Brüning is composed of 3 names. You can examine and separate out names.